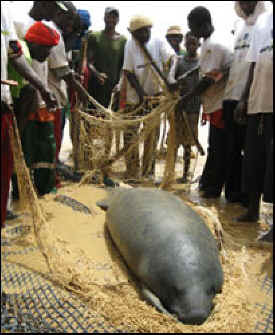 West Africa Rescue Fund: Just last week we sent $526 to Tomas Diagne to purchase manatee rescue nets in Senegal, West Africa. In the last three years, with the help of SMC, Tomas and his crew have rescued more than 10 highly-endangered West African manatees trapped behind the Nawel Dam, constructed along their migration route in northeast Senegal. The need for rescues continues -- there are manatees trapped behind the dam again, and a rescue is planned. 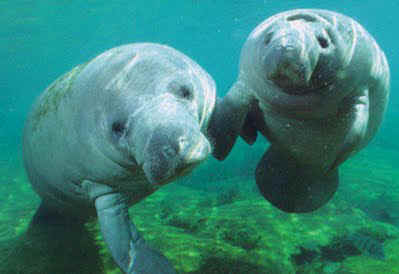 Once manatees are spotted behind the dam, fast action may be needed to ensure their health and survival. For this reason, funds must be readily available because there's no time to submit a formal funding proposal or carry out another fundraising effort and each rescue effort costs approximately $2,500 in fuel, personnel, and related expenses. According to Tomas, "If we want to be more effective in saving West African manatees, we need to be more proactive." A dedicated West Africa Rescue Fund would help ensure that we have the resources available to act quickly when colleagues in West Africa contact us. Cuba Education and Outreach: In the last year, we've begun collaborating with a Cuban manatee researcher to provide education and outreach materials. These materials help her reach out to fishermen, children, and other villagers, whose cooperation is essential to better understanding and protecting Cuba's manatee population. In 2012, we helped with poster printing, we provided manatee stickers with a Spanish message of manatee protection, and developed a Spanish version of our coloring and activity book to assist with these efforts. In 2013, I'd like to translate more of our outreach materials into Spanish, including our bookmarks, and produce colorful t-shirts -- particularly for children -- that feature a manatee design and a Spanish manatee protection message. Save the Manatee Club helped pay to print a poster that is being used to educate fishermen, children, and other villagers about manatees in Cuba. Brazil Education and Outreach: We recently committed $1,500 to help print a manatee conservation book for children in the Amazon. The book is illustrated by local children with drawings of manatees and their habitat. We sent them the template for our paper bag manatee puppet, and that was a huge hit! The group with which we are collaborating has many more ideas of how to reach children and adults to promote conservation, and the potential of what can be achieved is limited only by budget. Manatee Awareness in Jamaica: In March of 2011, I highjacked a romantic Jamaican vacation with my boyfriend to go on a manatee-finding expedition in which we were warned about bandits on sparse dirt roads. We found the manatees we sought, and since then, I have been corresponding with personnel in Jamaica's natural resources program to put together a plan to educate Jamaica's citizens about their resident manatee population. I recently received their final proposal, which includes an effort to increase reports of manatee sightings, since not much is known about the size of the population and their preferred habitat. Residents of coastal communities would be targeted for education, and those who spend the most time on the water, the fishermen, would be a particular focus for involvement with the sighting program. Funding is needed for such items as print material and travel to the various target communities. The program is ready to get underway, so I would like to provide financial support early in 2013. 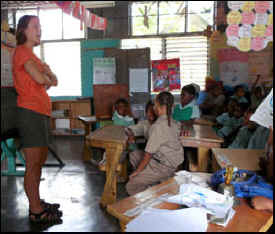 Community Outreach, Gales Point, Belize: In October, I worked with several residents of the Gales Point Community in Belize to develop a Community Outreach Program geared toward building stewardship for the animal life in the Southern Lagoon, including manatees. Gales Point has been the focus of manatee research for years, led by Sea 2 Shore Alliance, but there is a continuing need to educate the community about the natural treasures in their backyards and show them that they are rich with natural wealth. We created an ambitious plan that involves everything from painting garbage barrels with nature scenes and placing them throughout the village to collect trash, to sponsoring a youth soccer team named "The Manatees," and selling local crafts in SMC's gift catalog to help support the local economy. We hope to kick off the program early in 2013. I will plan a visit to the village, and we'll start some of the projects with the children and meet with local leaders. I'll also meet with the crafting community and deliver the synthetic materials they need for their handicrafts and help develop a business plan for selling their wares and getting proceeds back to the community.